The W108 Mercedes-Benz is one of the most desirable classic Benz’s around, with this 280SE taking top spot, and featuring the superb 3.5lt V8. The car was produced from 1965 through to 1972 (as well as a small North American run in 1973), and featured a variety of inline-six and V8 powerplants. The cars were available with four or five-speed manuals, or three or four-speed automatics. They were the flagship Benz of the time and featured various cutting-edge pieces of technology such as self-levelling air suspension. 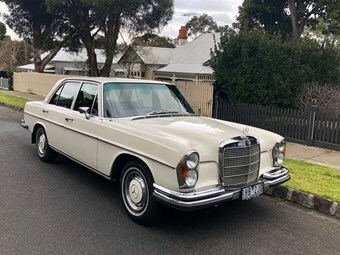 It remains a handsome thing, especially in the gorgeous white duco presented by this 1971 280SE. The 280SE featured the smallest V8 engine, and this one features a four-speed automatic. It presents near faultlessly, as a reportedly original and rust free car. The seller claims it has always been garaged and well maintained, still retaining its original Becker radio. Its white-over-red colour scheme looks stunning, and the interior is hard to fault with only minor creasing and cracking visible on the driver’s seat. For $33,000; this is an affordable entry point into classic Benz ownership. The car is based in Victoria, and you can check out the full listing here!